In 1825, the village was founded by William Mills and approximately 100 families, followers of Robert Owen, who wanted to emulate the utopian community at New Harmony, Indiana. The communitarian efforts dissolved due to internal conflicts. The Little Miami Railroad was completed in 1846 and brought increased commerce, inhabitants, and tourism. The village was incorporated in 1856. Antioch College was founded in 1850 by the Christian Connection, and began operating in 1853 with the distinguished scholar Horace Mann as its first president. In 1920, Arthur E. Morgan became the innovative president of Antioch College, implementing a much-imitated work-study program for students. An engineer by training, Morgan left Antioch to become head of the Tennessee Valley Authority in Franklin D. Roosevelt's Administration. Upon his return to Yellow Springs, Morgan was a key leader of Quaker intentional community developments in Ohio and North Carolina. Antioch College expanded beginning in 1964 to include 38 "centers" around the country by the end of 1979, with the by-laws changed to define Antioch as a "network", not a college, owned by Antioch University Corporation. In 1986, 32 of its units around the country were closed, leaving 6 campuses which included both its original College campus in Yellow Springs and the college's School of Adult and Experiential Learning in Yellow Springs, operating separately as Antioch University McGregor. That adult and graduate education school became Antioch University Midwest in 1988. 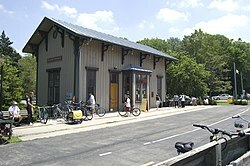 In 2008, citing financial exigency, the University closed the College campus in Yellow Springs. College alumni, forming the Antioch College Continuation Corporation, bought back the College's name and campus, and reopened in 2011 as the independent Antioch College. Now, Antioch University and Antioch College are wholly separate institutions. The Conway Colony, a group of 30 freed slaves who were transported by Moncure D. Conway, the abolitionist son of their former owner, settled in the village in 1862. Wheeling Gaunt, a former slave who purchased his own freedom, came to Yellow Springs in the 1860s and owned a substantial amount of land upon his death in 1894. Gaunt bequeathed to the village a large piece of land on its western side, requesting that the rent be used to buy flour for the "poor and worthy widows" of Yellow Springs. Although the land was used to create Gaunt Park, and thus does not generate rent, the village expanded the bequest to include sugar and still delivers flour and sugar to the village's widows at Christmas time, a tradition that generates annual media coverage. During the Red Scare of the 1950s, Yellow Springs and Antioch came under scrutiny for alleged sympathies to the Communist Party due to many locals' support of left-wing politics. After being questioned by the Ohio House Un-American Activities Committee, Antioch president Douglas McGregor released a statement in 1952 that "Antioch upholds the American tradition of academic freedom. This means the right to hear and investigate all sides of any question, including the question of Russia and Communism". By the late 1960s and early '70s, the village became a center of activity for the Civil Rights Movement and anti-war movement in southwestern Ohio, creating a sociopolitical demographic change which remains today. 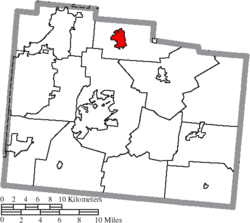 In 1979, Yellow Springs held the distinction of being the smallest municipality to pass an ordinance prohibiting discrimination based on sexual orientation. 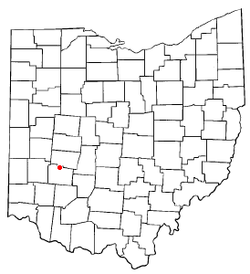 As of 2014, it had the largest LGBT population of all Ohio's villages. Yellow Springs is located at 39°48′6″N 83°53′34″W﻿ / ﻿39.80167°N 83.89278°W﻿ / 39.80167; -83.89278 (39.801723, −83.892662). According to the United States Census Bureau, the village has a total area of 2.02 square miles (5.23 km2), all of it land. The village takes its name from a natural spring located in the nearby Glen Helen Nature Preserve which is rich in iron ore, leaving a yellowish-orange coloring on the rocks. As of the census of 2010, there were 3,487 people, 1,672 households, and 902 families residing in the village. The population density was 1,726.2 inhabitants per square mile (666.5/km2). There were 1,805 housing units at an average density of 893.6 per square mile (345.0/km2). The racial makeup of the village was 78.1% White, 12.0% African American, 0.6% Native American, 1.5% Asian, 0.4% from other races, and 7.3% from two or more races. Hispanic or Latino of any race were 2.0% of the population. There were 1,672 households of which 25.4% had children under the age of 18 living with them, 37.4% were married couples living together, 13.5% had a female householder with no husband present, 3.1% had a male householder with no wife present, and 46.1% were non-families. 39.2% of all households were made up of individuals and 15.4% had someone living alone who was 65 years of age or older. The average household size was 2.04 and the average family size was 2.70. The median age in the village was 48.5 years. 19.7% of residents were under the age of 18; 5.1% were between the ages of 18 and 24; 20.6% were from 25 to 44; 33.1% were from 45 to 64; and 21.6% were 65 years of age or older. The gender makeup of the village was 46.0% male and 54.0% female. According to the US Census Bureau's 2006–2010 American Community Survey, the median income for a household in the village was $56,000 and the median income for a family was $71,379. Males had a median income of $52,208 versus $52,019 for females. The per capita income for the village was $32,886. About 6.7% of families and 15.1% of the population were below the poverty line, including 12.0% of those under age 18 and 10.1% of those age 65 or over. As of the census of 2000, there were 3,761 people, 1,587 households, and 896 families residing in the village. The population density was 1,981.3 people per square mile (764.3/km²). There were 1,676 housing units at an average density of 882.9 per square mile (340.6/km²). The racial makeup of the village was 76.58% White, 14.97% African American, 0.51% Native American, 1.49% Asian, 0.72% from other races, and 5.74% from two or more races. Hispanic or Latino of any race were 1.94% of the population. There were 1,587 households out of which 24.8% had children under the age of 18 living with them, 40.4% were married couples living together, 13.2% had a female householder with no husband present, and 43.5% were non-families. 35.9% of all households were made up of individuals and 10.4% had someone living alone who was 65 years of age or older. The average household size was 2.11 and the average family size was 2.73. In the village, the population was spread out with 18.4% under the age of 18, 14.1% from 18 to 24, 23.5% from 25 to 44, 27.2% from 45 to 64, and 16.8% who were 65 years of age or older. The median age was 41 years. For every 100 females, there were 80.0 males. For every 100 females age 18 and over, there were 73.1 males. The median income for a household in the village was $51,984, and the median income for a family was $67,857. Males had a median income of $41,875 versus $37,744 for females. The per capita income for the village was $27,062. About 7.3% of families and 7.0% of the population were below the poverty line, including 11.2% of those under age 18 and 3.4% of those age 65 or over. Yellow Springs Exempted Village School District (Yellow Springs Schools) operates three schools in the village: Mills Lawn Elementary, McKinney Middle School, and Yellow Springs High School. Antioch College was founded at Yellow Springs in 1850. The city is also home to Antioch University Midwest. Yellow Springs has a public library, a branch of the Greene County Public Library. Yellow Springs is the home of public radio station WYSO, which is a member station of National Public Radio and is licensed to the Board of Trustees of Antioch College. Local news and events are covered by an independent weekly newspaper, the Yellow Springs News. Irene Bedard, actress known for voicing Disney's Pocahontas. ^ Hellmann, Paul T. (May 13, 2013). Historical Gazetteer of the United States. Routledge. p. 878. Retrieved November 30, 2013. ^ a b Donahue, Bill (September 16, 2011). "Can Antioch College Return From the Dead Again?". The New York Times. Retrieved July 15, 2012. ^ Chiddister, Diane (February 4, 2010). "A history of racial diversity". Yellow Springs News. Retrieved July 15, 2012. ^ "Flour, sugar and tradition of caring". Yellow Springs News. December 11, 2003. Retrieved September 26, 2006. ^ a b Chiddister, Diane (2005). Two Hundred Years of Yellow Springs. Yellow Springs, OH: Yellow Springs News. pp. 145–148. ISBN 0976915804. Retrieved July 21, 2012. ^ Huffstutter, P.J. (June 23, 2007). "Old college try isn't enough for Antioch". Los Angeles Times. Retrieved July 22, 2012. ^ Johnson, Gregory A. "Workplace Discrimination". glbtq.com. Retrieved August 11, 2007. ^ "Gay, Lesbian, Bisexual & Transgender Civil Rights Laws In the U.S." (PDF). The Policy Institute of the National Gay and Lesbian Task Force. August 1998. Retrieved August 11, 2007. ^ Robinson, Amelia (January 31, 2014). "Local city and villages among those with most gay couples". Dayton Daily News. Retrieved February 27, 2017. ^ Mangus, Michael; Herman, Jennifer L. (2008). Ohio Encyclopedia. North American Book Dist LLC. p. 585. ISBN 978-1-878592-68-2. ^ "About us". Yellow Springs Schools. Retrieved February 25, 2018. ^ "Four years after closure, Antioch College to welcome its second class". Antioch College. Retrieved February 25, 2018. ^ "Locations". Greene County Public Library. Retrieved February 25, 2018. ^ Laura Dempsey (December 8, 2008). "WYSO picks NPR veteran as new GM". Dayton Daily News. Retrieved January 14, 2009. ^ The Associated Press (September 11, 2006). "Chappelle plans to stay in Ohio town". USA Today. Retrieved June 5, 2010. ^ "Republican Mike DeWine wins Ohio governor race, CNN projects". ^ "Mike Kahoe Statistics and History". Baseball-Reference.com. Retrieved July 23, 2012. ^ Walle, Randi (January 18, 2019). "Young's Jersey Dairy Celebrates 150 Years". Columbus Underground. Retrieved March 23, 2019.